Greenhouse gas emissions from the agricultural sector can be reduced through implementation of improved management practices. For example, the choice of manure storage method should be based on environmental decision criteria, as well as production capacity. 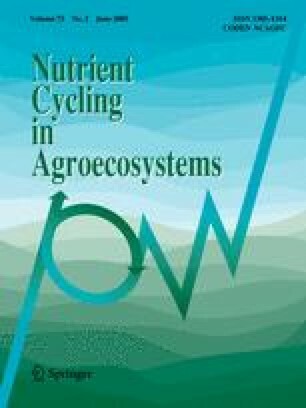 In this study, greenhouse gas emissions from three methods of storing dairy and beef cattle manure were compared during the summer period. The emissions of CH4, N2O and CO2 from manure stored as slurry, stockpile, and compost were measured using a flow-through closed chamber. The largest combined N2O–CH4 emissions in CO2 equivalent were observed from the slurry storage, followed by the stockpile and lastly the passively aerated compost. This ranking was governed by CH4 emissions in relation to the degree of aerobic conditions within the manure. The radiative forcing in CO2 equivalent from the stockpiled manure was 1.46 times higher than from the compost for both types of cattle manure. It was almost twice as high from the dairy cattle manure slurry and four to seven times higher from the beef cattle manure slurry than from the compost. The potential reduction of GHG was estimated, by extrapolating the results of the study to all of Canada. By composting all the cattle manure stored as slurry and stockpile, a reduction of 0.70 Tg CO2-eq year−1 would be achieved. Similarly, by collecting and burning CH4 emissions from existing slurry facilities, a reduction of 0.76 Tg CO2-eq year−1 would be achieved. New CH4 emission factors were estimated based on these results and incorporated into the IPCC methodology. For North-America under cool conditions, the CH4 emission factors would be 45 kg CH4 hd−1 year−1 for dairy cattle manure rather than 36 kg CH4 hd−1 year−1, and 3 kg CH4 hd−1 year−1 for beef cattle manure rather than 1 kg CH4 hd−1 year−1.